B2. 10K At 0VU-60 Hz - Mind Boggles! The debut Dub Syndicate set from 1982, pre-dating the involvement of mainstay Style Scott. This features various members of Creation Rebel and African Head Charge turning out a wild dub set, with hard-hitting rhythms and FX-mutated melodies phasing in and out of the mix. Recorded quickly with track titles cheekily poking fun at the contemporary series by The Scientist which pitted him against various b-movie foes. 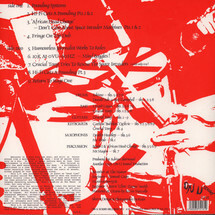 The tunes themselves however are deadly serious, with version excursions on some classic On-U vocal cuts such as “Bedward The Flying Preacher” and “Across The Red Sea”, and a continuing commitment by producer Adrian Sherwood to take his love of reggae and filter it through his exploratory and uniquely English approach. Vinyl reissue re-cut at Dubplates & Mastering in Berlin.